ROSS TOWNSHIP (CNN) Jerry Lynn hasn’t had a quiet evening in 13 years. 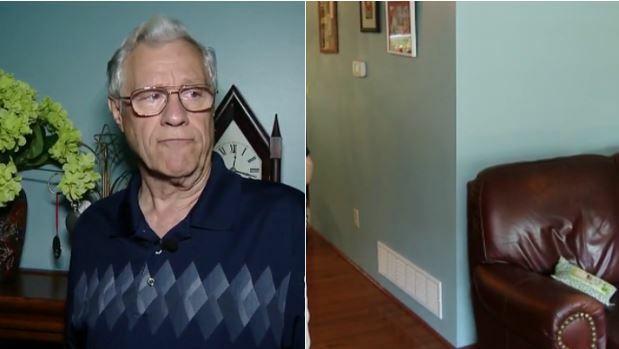 Every night at 6:50 ET — 7:50 during daylight saving time — the alarm clock stuck in the Pennsylvania homeowner’s living room wall rings. And rings. And rings. Lynn thought the clock’s batteries would run out within two or three months. But every night since he dropped it down the second-floor air vent in September 2004, the incessant beeping starts like clockwork. It starts off softly, then gets louder and louder. The ringing lasts just less than a minute, Lynn said, adding that he can hear it from any room on the first floor. Dropping the alarm into the wall was intentional. Not being able to pull it back up was not. Thirteen years ago, Lynn tied his wife’s clock to a string and lowered it through the vent toward the living room. He needed to figure out where to poke a hole in the wall to hook up his TV wire. Lynn thought he could listen to the alarm, which he set to go off after 10 minutes, and know where to put the hole. That was before the string broke and the clock fell to the bottom, where it has been going off at the same time in perpetuity. For Lynn, even though the clock got stuck, the end somehow justified the unintended means. He could still hear where he needed to poke a hole in the wall. As for putting the beeping to rest, Lynn and his wife don’t have any plans to retrieve the alarm clock. He figures that as his family gets older, he and his wife eventually will have to sell the house — but this doesn’t seem like something they would necessarily have to disclose, Lynn said. Lynn doesn’t remember the brand or type of batteries that have lasted this long, and he’s not sure about the clock itself, either. He said he doesn’t recall ever replacing the batteries that probably came with the clock, but he does know that the clock wasn’t very new when he dropped it. Even though Lynn has a daily, audible reminder of what went wrong 13 years ago, he stands by his plan.